This past Wednesday marked not only the first night of Hanukkah, but also the inaugural event of Wine and Dine B7 (B7 stands for Be’er Sheva for the uninitiated out there). Started by Boston transplant and Be’er Sheva resident Amir Katz, Wine and Dine B7 is aimed primarily at the Anglo community in Be’er Sheva. Katz is hoping to draw attention to the culinary treasures that lie in Be’er Sheva (yes, they exist) and bring people together over food and wine. 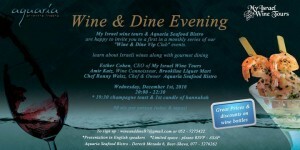 The first of what will hopefully be a monthly event series took place at Aquaria Seafood Restaurant on Mezada and Rager. The discovery of Aquaria was the first positive outcome of the event – I had no idea this cozy, inviting restaurant was tucked away here or that you could get so much shrimp and calamari in Be’er Sheva. Chef-Owner Ronnie Weisz trained in kitchens around the world before returning to his hometown to open, of all things, a seafood restaurant in the desert. And it was the ideal backdrop for our intimate evening of wine, cheese, and conversation. The wine tasting was led by Esther Cohen of My Israel Wine Tours. Cohen – another Boston transplant – started her company 10 months ago when she saw a need for wine tours in Israel. On a side note, we’re planning a tour for January so stay tuned for more details. For this evening, Cohen brought the wine tour to Be’er Sheva with a selection of four wines from two of Israel’s five wine regions. She began with a brief “wine tasting 101” in which she gave a helpful primer on the proper way to see, smell, and taste wine. She described each wine in detail – the grape, terroir, fermentation process, and taste – before serving everyone a sample. The two wines from Galil Mountain were the big hits of the evening. Their 2008 Shiraz-Cabernet is a medium- to full-bodied red that is aged in American oak for 10 months. I was interested to learn that while the Shiraz grape first came to Israel in the 1990s, Cabernet Sauvignon grapes were first planted here 100 years earlier and are now the most widely planted vineyards in Israel. The bottle I walked away with (the event also came with discounts on the wine we tasted and a selection of wine jams) was the Galil Mountain 2009 Viognier. A white wine with a lot of character, the Viognier is aged partially in stainless steel and partially in French oak, giving it flavor elements of both processes. At 15%, the 2009 Viognier has a high alcohol content – especially for a white – that is typical of New World wines. With lightly fruity, herbal notes and just a hint of oak, this is a white wine I can get behind. The other two wines served were also excellent. The 2006 Tzuba Merlot from the Judean Hils was a big, bold red with lots of ripe fruit flavor and reminded me of a California Merlot. The Har Admon dessert wine from the upper Galilee was the most surprising wine for me. As someone who typically shies away from sweet-on-sweet pairings and dessert wines in general, this selection was a refreshing change. While definitely sweet, it retained the character of a rose wine (it is produced from Cabernet Sauvignon, Shiraz, and a bit of Chardonnay) and was not overly syrupy. Definitely a treat to end the night. The wine was complemented (and soaked up) by a selection of excellent cheeses, breads, crudités, and carpaccio provided by Chef Weisz. A live guitarist played in the corner. Good conversation was had. 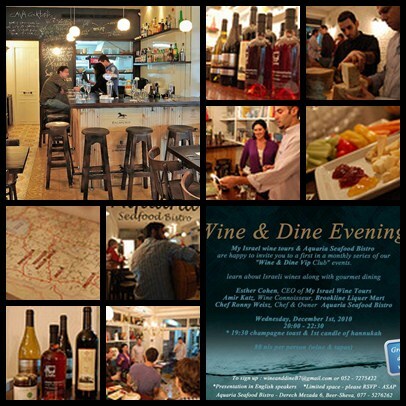 The first Wine and Dine B7 event was lovely and something that Be’er Sheva desperately needs. If you missed this one, be sure to come out for the next! I know I am looking forward to the next installment.